Ex-Can-Am racer and longtime website contributor Jerry Entin sent these two photos taken by Ike Smith. In 1959, Swiss expatriate and fellow Monterey Peninsula racer Jean-Pierre Kunstle created the "Ferrotus", an unusual combination of Lotus Mk.15 #619 FPF 1102 powered by the 2-liter Ferrari 4-cylinder engine from Jack Nethercutt's Ferrari 500TRC #0708. 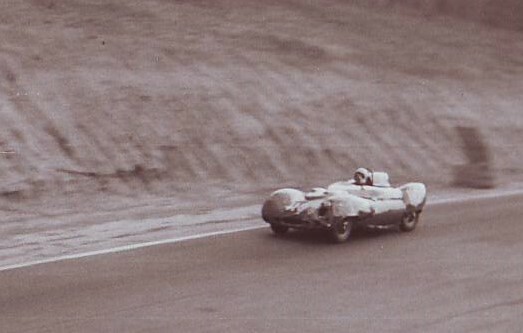 Parsons bought the car from Kunstle and raced it with some success in 1960-61. This shot shows Parsons during the first S.F. Examiner-sponsored "Pacific Grand Prix" on October 22-23, 1960. BONUS PHOTO -- and a great one! 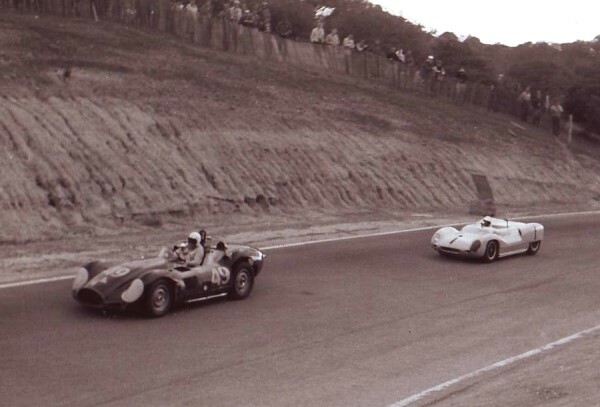 George Constantine in the "Kelischev", or Kelso Lister-Chevy, leads Stirling Moss in the pea-green Lotus Mk.19 that Moss drove to victory in the October 23, 1960 inaugural "Pacific Grand Prix". What's interesting about this photo is that Constantine led one lap, the third, of the second heat of the 1960 "Pacific Grand Prix". Moss passed him braking for Turn 9 on the next lap and went to win the race overall after winning both heats. I think this photo was taken during Constantine's brief moment of glory. John Mozart campaigns the ex-Constantine car in historic races today.